Getting to the Safaie/Mason wedding requires some more travel. And we have acquired new travelling companions. Apart from the Mason family and Mr Safaie, we link up with Mrs Safaie Senior, her daugher, Mrs Larkman and Ms Nicola, a school friend of Ms Mason’s so we are now a party of 9. 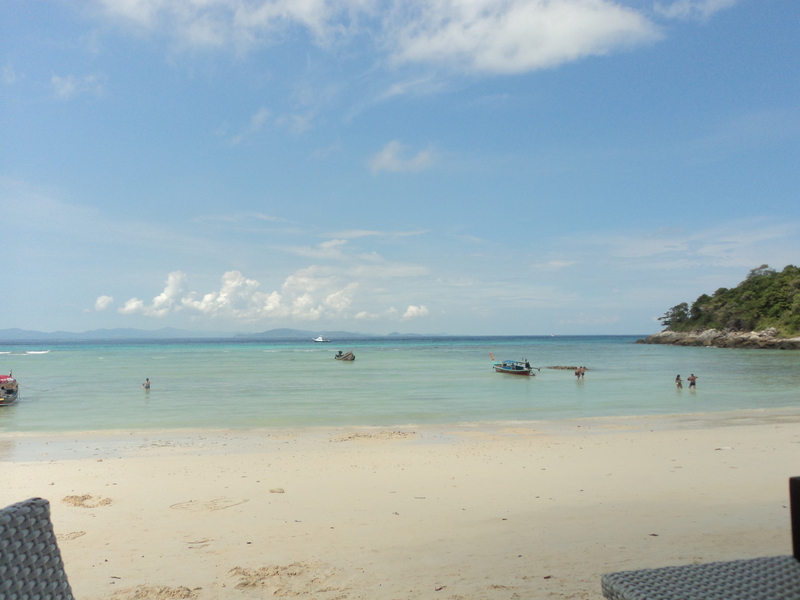 We fly to Phuket at a ghastly hour of the morning and from there pile into a minibus which hurtles us to the quayside where we are to catch a speedboat to Koh Racha. The traffic is heavy and we are late but fortunately Thai time is on our side and there is a relaxed attitude when we arrive at the quay. En route, we stop briefly at a travel office so the driver can go and relieve himself and no sooner has he left the van than the side door is opened by a ladyboy who is solicitous in asking whether we need any help with travel plans or need somewhere to stay. She is perhaps not one of the most attractive ladyboys although is perfectly pleasant and as she shuts the door, Mr Mason says “Nice lad” which has the minivan rocking with laughter. As we have been staying in Ari in Bangkok, we have not had the opportunity to see many ladyboys so we were perhaps a tad over-excited to see her. The next exciting instalment in our journey is getting on the boat. We sit and watch the men heft our luggage onto the speedboat without perhaps thinking of how we will heft ourselves onto it. Since being on steroids for a protracted time and following the disastrous second type of chemotherapy which left me in hospital for a week, my muscles have atrophied and weakened and have still not recovered. The way onto the boat is to wade through the water and haul oneself up. Hmmm. I can see this will be interesting. When it gets to my turn, the men are helpful but assume I am capable of climbing up onto the boat. They show me where the step is and pat it invitingly but fail to understand that even if I put my foot on it (which one of them actually does), I will not have enough power to lift myself up. It is an early pantomime for anyone watching and, of course,I fall off spectacularly, much to their consternation. I am plucked from the thankfully warm sea by several Thai men who somehow manage to haul me onto the boat. I now have a wet bum. 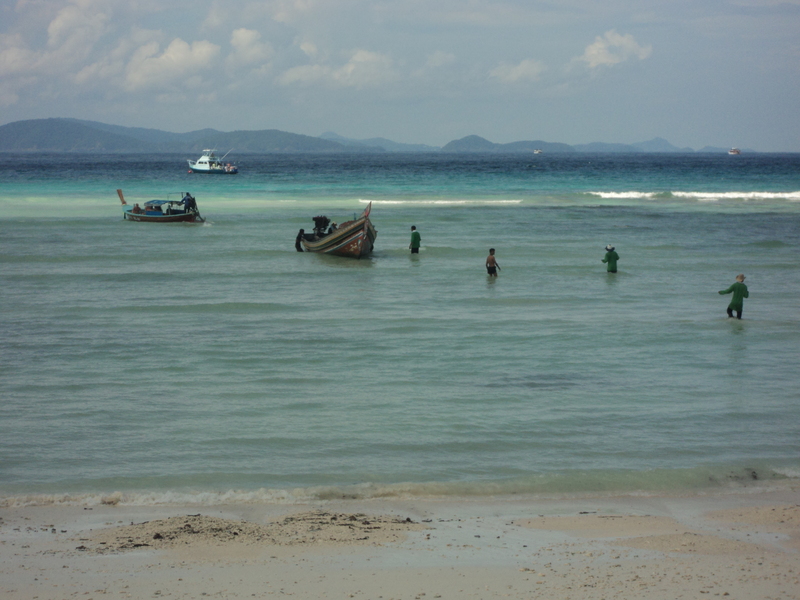 The journey to Koh Racha takes about an hour and is fun if you are not prone to seasickness which, happily, I am not. 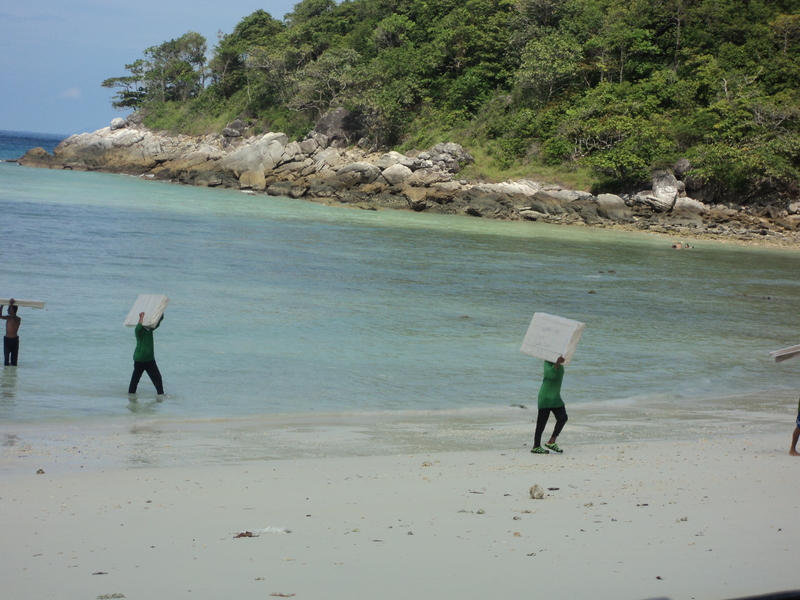 When we arrive at the island, we have to go through the same performance in reverse. I turn around to get down the ladder backwards but, sadly, there is only 1 step on the ladder and I am already on it. With the boat going up and down and with my efforts to locate a step which doesn’t exist, I fall off the boat again. I suspect the Thai men are too polite to roll their eyes but they cry out and say “OK, you are OK” as they grab hold of me again and put me upright. Another wet bum. We are taken to reception to register and the lovely, polite people in reception see me with a walking stick and entreat me to sit down. I don’t want to wet their furniture and loiter, causing them anxiety. The water dripping from my trousers also makes the floor incredibly slippery and I am concerned I will make things worse by up-ending myself again. The man who has been organising the wedding with Ms Mason arranges a golf cart and takes us off to a beautiful villa in the gardens where we will spend the next few days. They put Mr Mason junior and Ms Atherton in the villa next to ours while Ms Mason and Mr Safaie have a very grand room in the main block. 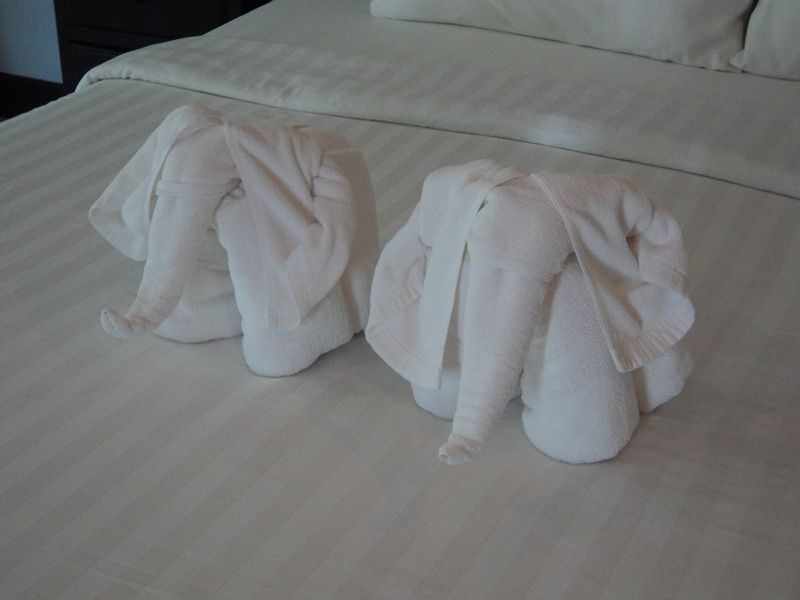 Every day the maids make a different arrangement with the towels on the bed which is always fun to see. The restaurant is right on the beach and so breakfast, lunch and dinner can be taken with an unobstructed view of the sand and the sea which is a fabulous medley of blues and greens. One morning we sit and watch shoals of small fish working their way up and down the bay. Periodically they leap into the air just for extra entertainment. One lunchtime, Mr Mason and I linger over our lunch and watch a beautiful boat draw in. Once it is anchored. men jump over the side and proceed to carry its cargo through the water to the shore. It seems slightly incongruous to realise they are actually carrying flatpack furniture. This is probably Ikea delivering Thai-style. It is so long since I blogged that you may think I had fallen off the edge of the world. Happily this is not what has happened but read on and I shall tell you all. When you left me last, I had just broken a front tooth eating a plum. It seems grossly unfair to break a tooth with a piece of fruit. Had it been toffee or a Crunchie, well, there might be some justice in it but fruit – well, that’s just plain wrong. I have to make an appointment at the dentist who tends to shout at me and she can’t see me until a couple of days before we fly to Bangkok. On this occasion she has obviously taken some happy pills or has just billed a massive dental bill because she is nice to me although somewhat snippy with her dental nurses. I ask if it can be fixed and she assures me she can do something. She is, as usual, critical of any dental work I have had done previously, but manages to make me a new front tooth out of something – maybe porridge – which she hardens with a blue light and then we are all done. It’s not perfect but will do for now. We have another lovely woobs session at the Maggie Centre on the Wednesday. I am always amazed how far people come to have fun with paint and pretend they are no good at art. This time we have people from Rugby, Manchester and Hampshire as well as a sprinkling of Londoners. I am starting to feel some neuropathy in my right hand as well as in my foot but it’s the hand that causes problems when painting. I have the manual dexterity of a 2 year old which also makes getting dressed a challenge. Ms Kennedy-Shaw, one of our stalwart Wave Walkers (our dragon boat team, please keep up) makes a huge number of Lamingtons which are very popular and are pronounced light as air. Ms Hutchison, from Hello Beautiful, tells us she has over 750 decorated woobs and that there will be a festival next year where they will be displayed. Watch this space! It really is a beautiful thing as each woob is painted quite differently from any other and they tell an amazing story of women and their struggles with breast cancer. The following day it is time to go to Bangkok. Our flight is in the evening so we have the luxury of packing during the day. Master Mason and Ms Atherton join us during the afternoon and bang on time, the taxi arrives to take us to Heathrow. I manage to get into the cab without anyone manhandling me and when we arrive at the airport, I get into the wheelchair and off we go. I am disinclined to wait in the queue for ages and spot a Thai Airways desk which seems more than quiet, with staff lolling around, chatting. Rolling up in the wheelchair, they decide they will book us in, even though they are really just for first class passengers. No-one asks to see the letter from the consultant to say I am fit to fly, even though I have highlighted the relevant passage. They ask for the dimensions of the wheelchair all over again, even though I have given them over the phone except this time they have to estimate them because, surprisingly, I don’t know them off the top of my head. I ask whether there will be any chance of being upgraded and one of the staff members still lolling laughs in my face and says “Those days are long gone”. When we get on the plane, we find it has an upstairs which would be difficult for me to navigate anyway. We are given seats at each end of a block of 4 seats so we get to stretch out a little on the flight. Arriving at Bangkok, I am whisked away in a huge wheelchair by a very nice man. I am a little anxious about where my own wheelchair has gone and once we arrive at the baggage reclaim, having been taken through priority channels to exit, he has to sprint halfway back to the plane to retrieve it. The tip I give him is, I am later told, pretty much a day’s wages for airport workers. Ah well, at least he had something nice to tell his wife when he got home. Ms Mason (as she was) is waiting for us at the exit and we manage to get a cab which fits all of us and, quite alarmingly, our luggage. The bags are slung on top of the cab and while we look on, waiting for bungees to be produced, the rest of the luggage is chucked in the back and Ms Mason ends up in a seat where her view is impeded by the footrests of the wheelchair. She has seen Bangkok before, though, to be fair. No bungees are forthcoming and the taxi lurches out into the traffic while we wait to see which bag will fly off the roof first. Surprisingly, none does and we make it in one piece to the apartment we have booked for the first leg of our stay. Bangkok traffic is the delight of Mr Mason as it is fast, heavy and utterly tolerant. People drive as fast as they can and other drivers try to cut in without anyone getting hit. One of Mr Mason’s favourite journeys was from Kanchanaburi to Bangkok where the driver drove mostly along the inside lane at breakneck speed, occasionally deviating and driving through car parks and petrol station forecourts. And it was pouring with rain but we lived to tell the tale.